After yesterday’s armadillo fail, I was eager to get back out on the streets of Victoria and give it another go. Though I wasn’t all that thrilled to go out and retrace many of the same roads that made up yesterday’s “almost” armadillo, I was eager and determined to right yesterday’s wrongs. Also it was Friday afternoon, and this provided the perfect excuse to take a break from work and ride my bike in the sunshine. I’m much happier with this specimen. It’s a nine-banded armadillo (Dasypus novemcinctus) – a solitary, nocturnal critter found in North, Central, and South America. Say, did you know that armadillos harbour Mycobacterium leprae, the bacterium that causes leprosy? So if you should happen upon an armadillo, don’t touch it. Or kiss it. Or eat it. 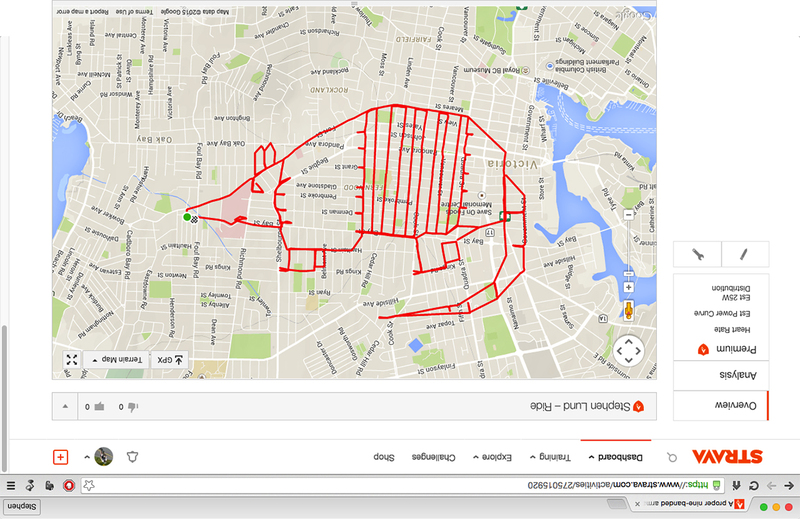 This entry was posted in gps art and tagged armadillo, bicycling, creativity, cycling, garmin, gps, gps art, nine-banded armadillo, strava, strava art, victoria bc. Bookmark the permalink. I just Googled Armadillos, what curious creatures! Aren’t they? One of my followers on Strava – a fellow from East Java, Indonesia – commented that “in Indonesia we call this animal Trenggiling.” I suggest you google Trenggiling – it’s a mighty cool looking critter!